The Prime Minister, Peter O’Neill, has expressed concern over 'political backflips' by sacked Ministers in the lead-up to the National Election. 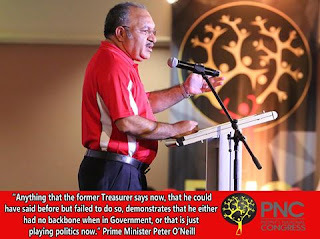 “In just a few weeks we have seen National Alliance party members abandoning long-held and publicly stated policy positions and claiming that they had not been honest in their public statements while in Government,” the Prime Minister said. “Now the former Minister has discredited his own statement to Parliament." The Prime Minister said. This election do not vote for candidates who will happily mislead the public for the sake of political point scoring. Vote for the only party that has STAYED STRONG with their plan for our nation.